Clocks run at a steady pace, that’s the whole point of them after all. But time itself doesn’t always move in accordance with clocks, especially when it comes to music. Case in point: How fast does time move when change is afoot? When is a week more like a lifetime? How quickly can events upend every thing you take for granted? A few not-so-random questions to contemplate heading into this review, where five short days came to symbolize the difference between failure and success, between the past and the future and between irrelevancy and immortality. On December 23, 1947 Wynonie Harris was in the studio for the third time since signing with King Records at the beginning of that month. The first two sessions hardly went well. Harris, drunk and obstinate, spent most of his time alternately berating the musicians and arguing with label owner Syd Nathan demanding that his new boss deliver a Cadillac (the same night!) for his services. In between he stumbled clumsily through the material, none of which were exactly solid compositions to begin with, nor musically relevant as the sand in the hourglass of long established black music styles he was conversant in was rapidly running out. Confronted with a volatile egomaniac whose artistic decline over the past few years was evident in the record company merry-go-round Wynonie Harris found himself on (King being his fifth stop since going out on his own a few years back) as well as in the lack of any discernible hits for much of that time, Nathan probably was regretting his decision to bring him into the fold after witnessing the fireworks that ensued when Harris showed up in no condition to work. But there wasn’t much that could be done about that now and with a recording ban looming at the end of the following week Nathan had little choice but to make the best of a bad situation and try and get some usable material in the can. So with both self-contained bands that had the misfortune of backing Harris those first two times out refusing to work with him again under any circumstance Nathan searched elsewhere and wound up hiring the best musicians available, ones with some recent experience dealing with the live wire vocalist. This aggregation was led by trumpeter Hot Lips Page and included tenor sax aces Tom Archia and Hal Singer and having just toured with Harris in the fall without cutting his throat and leaving him lying in an alley somewhere that said a lot about their patience and restraint. If nothing else Nathan must’ve hoped their professionalism might light a creative fire under Wynonie’s tail. It might not quite have done that, not yet anyway, but it seems to have at least gotten Harris to focus on the task at hand – making records – rather than simply making trouble. That doesn’t mean the results were all that promising however. Though Harris himself was toeing the line in the studio and the band was more than equipped to handle their roles with the appropriate seriousness, they didn’t have much to work with song-wise. 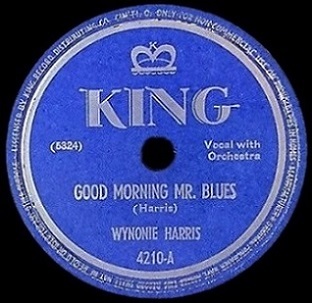 Good Morning, Mr. Blues is indicative of his less than stellar material and further proof that, at least in the case of Wynonie Harris, the move from fringe dweller in rock’s outskirts to the biggest star at the center of its universe was largely due to a fortuitous set of circumstances that could never have been planned. One of the unique character traits of Wynonie Harris, the singer more than the man himself who had far too many unique character traits to fit in a mere two thousand word essay, was his approach to cutting records. Harris was an atypical songwriter to say the least. He was not a musician in any way, someone who composed on piano or guitar, plotting the melody and tying it in with well-crafted storyline, but rather an improviser who had a pretty good grip on his own persona which he’d readily expound on when coming up with lyrics on command. That’s not to suggest he wasn’t musical, he definitely was. For starters he had an innate way with rhythm, an ability to find his way back to melodies seemingly lost along the way, and at his best had a good rapport with band members (when he wasn’t threatening them with bodily harm that is), urging them on with a good-natured exuberance that could be disarmingly appealing. But he was also of a generation of singers who logged long hours on bandstands where the general rule of thumb was to keep the rowdy patrons engaged by never letting up, pushing the pace as well as the limits of accepted decorum to the breaking point. Unlike classier venues where tightly disciplined bands played well-rehearsed sets using written charts while maintaining an orderly structure in all they did, from set-list to presentation, the roadhouses and gin joints on the other side of the tracks where he came of age required its featured performers to be a combination musical performer, master of ceremonies and comedian. The band was simply instructed to keep pace and never stop playing no matter what arguments, brawls or gunfire erupted among the drunken patrons. Harris excelled in that wild-west setting, ad-libbing his way through basic song structures that were eminently familiar in theory to the bands while proving adaptable to whatever lyrics he might come up with, including tossing in plenty of racy double-entendres along the way. While that’s a vivid and vibrant scene to experience in the moment, once that moment is over and you’re out on the street after the club closes it only exists in your memory. The overall feel the singer elicited with their performance takes on more importance than the intricacies of the compositions they rendered. Not so for records which by nature are listened to much more closely than improvised lines on stage thereby requiring a surer hand to make sure they hold up to scrutiny. Therein lies the problem with Harris’s spontaneous approach to music making. When trying to adapt those specific skills honed on the chitlin’ circuit to the sterile confines of the recording studio to be captured on wax and replayed ad infinitum the results are sure to be frequently lacking in structure, coherence and, if his sheer enthusiasm can’t overcome those deficiencies, lacking in appeal as well, something which proves to be the case with Good Morning, Mr. Blues. It’s really not necessary to know the type of gigs Harris played at those aforementioned venues to be able to tell that this is an off-the-cuff performance at its core. He takes a fairly standard theme – that of dealing with a lifetime of bad luck – and spends almost three minutes expounding on it without ever digging too deep. Because the song itself never exits the slow lane Harris’s options vocally are somewhat limited. Much of what he’s already come to be known for – his colorful exhortations and asides to the band for instance which always reinforces his freewheeling image – are dropped altogether. His ability to verbally riff nonsensical utterances are similarly taken from his arsenal. About all he has remaining is his habit of bearing down on certain passages to convey more depth or urgency, yet that trait gets overused on Good Morning, Mr. Blues, indicating he was grasping for a way to leave his mark on this. It also doesn’t help that he sounds a little worse for the wear when it comes to sobriety. Unlike the previous two sessions in which Harris consumed alcohol at a rate more suited for a frat party than a recording session, getting more sloshed as the tapes rolled, this was the first song they cut for the day in question and he probably hadn’t had time to do any serious drinking since passing out the night before. But there are certainly moments when his tongue sounds as if it’s two sizes too large for his mouth and that’s usually a pretty good sign the mouth in question had been wrapped around a bottle not long before. As is becoming far too common for Harris he either flubs two of the song’s meager three stanzas or simply uses particularly ill-chosen lines, but either way he sounds as if he’s crossing himself up in confounding fashion. As for what that mouth is spewing out, the lyrics are essentially nondescript generalities as he talks about waking up to find the blues “walking out my door”, telling them goodbye rather than the Good Morning the title suggests, giving some indication that the title was an afterthought, not the basis for the song to begin with. The story set-up itself also lacks consistency as that first line suggests the blues are leaving him whereas the rest of the song makes perfectly clear that the blues are there to stay, something that DOES confirm the title’s premise. At least after that he sticks to that perspective instead of awkwardly trying to double back and make amends. He agonizingly bemoans his situation at length while never really delving into any details. Basically this is a mere snapshot of a man talking to himself at the end of the bar rather than a feature film of the events swirling around that led him to that state of mind. As for the band themselves, stellar musicians one and all with plenty of experience and musical know-how, their performance is similarly uneven. The tempo they’ve chosen, or Wynonie chose for them, impairs their ability to add much to the proceedings. Though it starts off well with a subdued elegiac trumpet line courtesy of Page which sets up the despondent mood nicely, they’re given no elbow room as it goes on to add much character to the song. As Harris seems ever in danger of losing his way – though he never quite does entirely – the band wanders out of focus from time to time. The most glaring example of this comes as Page and one of the saxophones clash behind Harris midway through before pulling it back together with a modest sax solo, though even that is far too slow to excite us and far too thin to impress us, even if it’s fairly suitable for the song’s concept. The slow pace, the lack of any excitement or memorable passages, and a need to keep from stepping on Harris’s toes means they’re straitjacketed in what they can offer. Tentative in their approach, more concerned with not flaming out than lighting things up, the results come off sounding like a band and artist feeling each other out with subpar material and still uncertain musical goals. As they broke for a few days to celebrate the holidays everybody involved, Harris, the band and Syd Nathan himself, had to wonder what could possibly salvage this shared venture. Though the musicians were merely working on hire and not permanently associated with either Harris or King Records they could nevertheless elevate the fare if given the opportunity. The label itself was seeing its own star rising as of late and their ability to sell its product – both literally in terms of national distribution and figuratively in the sense of promoting their artists – was very promising. At the center of it all you had Harris himself, an inconsistent though potentially dazzling artist who required a certain type of setting to excel. A setting that he seemed able to conjure up on stage well enough yet as shown here on Good Morning, Mr. Blues, something that didn’t quite translate to record. All of them were blindly in search of a solid musical foundation with which to rebuild his image, one that capitalized on his greatest attributes… his swaggering sense of self, his notorious reputation as a hell-raiser and ladies man, and maybe most importantly of all a sound that was unhinged enough for him to cut loose yet was still had the requisite structure to prevent him from flying off the rails altogether. What they needed was… well, you know what they needed, they needed a pure, concentrated, almost lethal dose of rock ‘n’ roll, and you also know they got that very thing when Santa Claus (or more accurately Roy Brown disguised as Santa Claus) delivered the perfect Christmas present to them during their break. When they reconvened five days later, the same band and the same singer in the same studio, they weren’t working with the same sub-par ideas and the same unfocused aims. Though they may not have fully grasped the rapidly shifting musical and cultural landscape they were presented with as 1948 approached, they HAD to understand the possibilities songs like Good Rockin’ Tonight offered them because they took full advantage of it and never looked back. That the two songs would share the same single when released two months later gives us all the chance to compare not just the results, which are predictably like (good rockin to) night and day (err… morning that is, if you go by this one’s title), but also to compare the mindsets of the participants. In Good Morning, Mr. Blues they are merely trying to make something rather flimsy come out moderately acceptable. They succeed at it (just barely… or at least don’t fail miserably at it) but they clearly don’t have much hopes beyond that. However the following week they find themselves reinvigorated by an unlikely combination of blind luck and circumstance and they collectively seem to know that with the sudden arrival of vibrant songs in a thoroughly modern no-holds-barred approach the stakes have been raised across the board and it will be considered an unpardonable failure if “moderately acceptable” are either their goals or the results they walk away with from here on in. Leave a reply on "Wynonie Harris: “Good Morning Mr. Blues”"